The news out of New York, contrary to what President Obama and other top government officials have said, is that the Ebola crisis appears to be getting worse in the U.S. Judicial Watch is striving to pry loose the truth from reticent federal agencies that have a responsibility for public safety and our national security. We have filed Freedom of Information Act (FOIA) requests with the Department of Defense (DOD) and the Occupational Safety and Health Administration. In light of the potential danger from this deadly disease, the administration’s long history of delaying and obstructing information requests could have severe consequences for members of the public who have been told that they are safe. We are prepared to go to court to force the release of critical pieces of information. Our Ebola FOIA requests ask for an immediate clarification of the DOD’s plans for the evacuation of U.S. personnel from Africa if an Ebola outbreak occurs. We are also looking for information from OSHA regarding any plans the agency has for responding to the current Ebola outbreak and any expressions of concern by OHSA personnel. Another key player here is a cryptic carrier known as Phoenix Air. We know this air carrier has been responsible for transporting Ebola victims, but that’s all the American people are being told. How safe is Phoenix Air, and what kind of relationship does it have with the U.S. government? This much seems clear: Phoenix Air is more than just a medical transport unit. It appears to have significant DOD contracts. One definitive move the administration made that is worth noting is the recent appointment of Ronald Klain as the Ebola czar. JW has carefully documented the constitutional problems with the appointment of congressionally unaccountable czars throughout various executive agencies. But there’s an additional problem with Klain’s appointment. His appears to be motivated more by politics and less by qualifications. Klain is not an expert in infectious diseases. He is a long-time Democratic operative who gained notoriety for his role in the legal challenges surrounding the 2000 presidential election. Klain also previously served as the chief of staff to Vice-Presidents Al Gore and Joe Biden. He’s what you call well-connected in Washington. For the rest of America, “well-connected” can be translated as “corrupt,” in this case. Klain’s involvement in Solyndra and the Clinton-era fundraising scams shows just how well-credentialed and well-suited he is to represent President Obama. True to form, Klain’s appointment shows that the Obama White House views the Ebola issue as more of a political crisis than a stark public safety issue. And, as we note in this important Investigative Bulletin piece, Czar Klain: No Way to Run a Republic, this is another czar who will undermine transparency and is another Obama end-run around the U.S. Constitution. The Washington Post reports that Klain is “tasked with coordinating domestic preparedness efforts and the U.S. military operation to help control the virus’s spread in West Africa.” He’ll report to Homeland Security adviser Lisa Monaco and National Security Advisor Susan Rice, the Post says. But the Federal Emergency Management Agency is also a player. And the Defense Department has a major role. And because it is Africa, so does the State Department. And so does the Department of Homeland Security. Power in Washington is in direct relation to proximity to the president. So a “czar” operating from the White House exercises powerful influence over these departments, which have a measure of transparency and accountability under the law that the czars do not have. There is one way President Obama can carry out this initiative. He can do this by offering foreign nationals a special parole. Under federal regulations, a parolee could be defined as an alien who is inadmissible to an inspection officer, but permitted into the U.S. for humanitarian reasons. Obama has already used this exemption for the illegal alien “minors” who illegally crossed our border. He could do this again, without notice or announcement, to open the door to foreign nationals carrying the deadly Ebola infection. 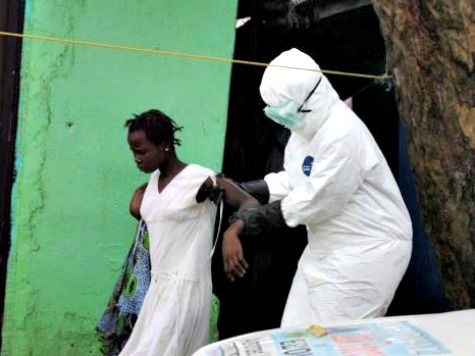 So, as some argue about whether to restrict flights and visitors from Ebola-afflicted countries in West Africa, Obama allegedly plans to allow non-citizens infected with the virus into the United States. All the flight and travel bans in the world won’t address this president’s abusive use of power to allow aliens with Ebola into the country. I see nothing under discussion in Congress yet that addresses this clear and present danger. Rep. Bob Goodlatte, Rep. Louie Gohmert (R-TX), and some members of the Senate are on the alert and ready for action after Judicial Watch’s disclosure, but the rest of Washington is asleep at the switch. Check in with your elected officials, wake them up, and tell them to pay attention – and act.